After reading that on top of having the best macarons in town, this pâtissier also made some first rate croissants, I knew I had to go. The boutique pâtisserie is tiny; while it's been around for a while its décor is uber modern, and the goods are laid out beautifully. I snapped a few shots and a curt employee informed me that pictures were NOT allowed. So we took our breakfast of champions to a bench by the Seine and I snapped pictures to my heart’s content! 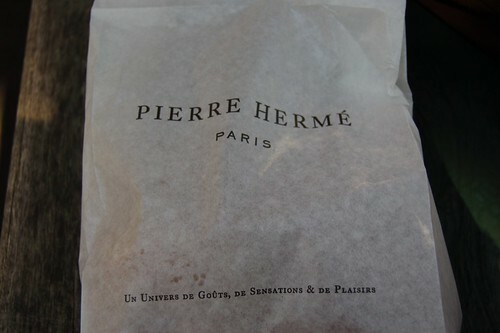 It was still early so I went straight for the croissants, and a few macarons of course! The buttery croissant was definitely one of the best I’d ever had. Perfectly puffed and flaky so that it was just as light as it was rich. 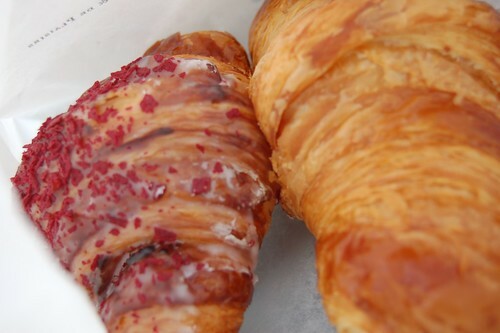 I was also easily seduced by the croissant Ispahan. One look at the description of pâte d’amande, framboises, glaçage à l’eau de rose and I was sold! It did not disappoint. I’ve read a few descriptions online but I don’t remember the description having lychee flavour nor did I imagine a solid filling inside. It was an almond croissant laced with raspberry and with the perfect flaky pastry on the outside. Croissant Ispahan: almond paste filing, raspberry and lychee compote and rose water icing. While I would not think I’d enjoy macaron looking at them, I had the chance to try some at a wedding and fell in love with them. Something about the lightness of the meringue cookie and the richness of the filling… I definitely had to try some Parisian ones. They are a totally different experience and are just an explosion of concentrated flavours in your mouth. And with flavours like strawberry-wasabi and vanilla-olive oil, who can resist? For my first tasting I chose a caramel à la fleur de sel, perfect in its complexity of flavour. 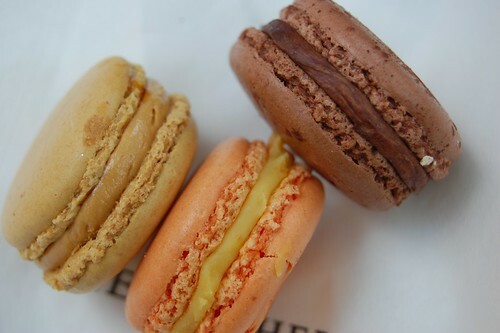 D chose an apricot-saffron macaron and we shared a chocolate one. They are a real treat to the senses. We brought a lovely selection back for Miss.Adventure and they are waiting for her in the freezer; news to come on how they hold up!